People have used pipe for thousands of years. Today, millions of tons of pipe are produced each year. The versatility of pipe makes it one of the most often used products offered by the steel industry. There are several methods of manufacturing steel pipe resulting in either “seamless pipe” or pipe with a weld seam,“welded pipe”. In both methods, raw steel is first cast into a more workable form, billets or slabs. 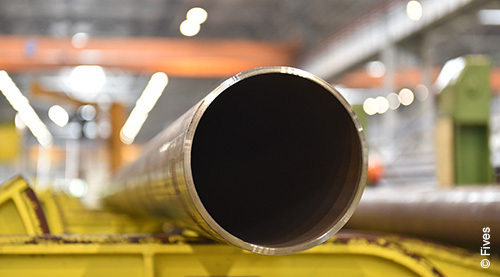 Seamless pipe is made by piercing a billet and rolling it into a hollow shell or extruding a billet through a die, while welded steel pipe is made by rolling a slab into a flat strip forming the strip into a round shape and then welding the edges together. Fives' global offer covers design and supply of complete tube making facilities for welded tubes, and a finishing floor for seamless and welded tubes for different industries: construction, automotive, general mechanical tubing, oil and gas, furniture, agriculture, chemistry, nuclear, etc. For some applications, the global offer includes inductors, quench machines and tempering furnaces.